Let me start by saying I’m a Star Wars fan. 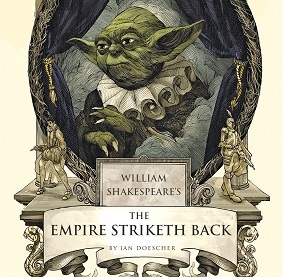 So much so that I waited until May 4th, Star Wars day to read Ian Doescher’s second installment of his William Shakespeare’s Star Wars series, The Empire Striketh Back. This like his first, William Shakespeare’s Star Wars, was sent to me by the good folks over at Librarything as part of their Early Reviewer’s program. Those who know me well also know I am a student of Shakespeare which is why I wanted to review the series. I absolutely loved the first one, but have some issues with the second. First let me praise Doescher for not only attempting to adapt Shakespeare for modern audiences but also for his masterful ability to condense an action packed movie into a 163 page book. Doescher manages to capture the excitement of the movie and doesn’t miss a beat as he seamlessly moves from one scene to the next. His use of iambic pentameter in such a skilled manner should earn him praise from poetry fans. Doescher sticks mostly to modern language and rhythm, with a few well known Elizabethan terms thrown in for good measure. Young fans of Star Wars can follow this book without feeling overwhelmed by the poetic style of writing and old language. One of the Doescher’s more cleaver tricks is giving voice to characters that had none in the movie. Take the Wampa who drags Luke off to his cave, as an example. And take no pleasure in my angry mood. Doescher reminds his audience that even the lowest of creatures have feelings and that their actions are not always done with malice. Wampa’s gotta eat too! We hear from the monster, Exogor, the worm like creature whose mouth the Millennium Falcon accidently flies into. He laments that his meal has fled and goes into a soliloquy about being alone. Yet for all of the fun Doescher brings to the mash-up, I cannot help but be disappointed in his use of Shakespeare’s work and the lack of ties to the plays. What no Henry IV or V battle scene speech? The back and forth banter between Han and Leia is very much like that we hear between Beatrice and Benedict, yet none of the other characters are nods to Shakespeare. The asides by Han and Leia got a little tiring. Each talk about how they feel about the other. Yeah, we get it. They like each other but are too proud to show it. Star Wars fans already know this and don’t need constant reminders. Doescher in his Afterward likens The Empire Strikes Back to a Shakespearian inspired tragedy, yet goes on to compare Luke with Oedipus. “Oedipus who learns only too late that his mother is his wife, tears out his eyes after she hangs himself. Luke discovers that Darth Vader is his father just after losing a hand-close enough, right?” No, wrong! How about this? Hamlet is told Claudius killed his father, just like Luke is told Vader killed his father. Luke finds out Vader is his father, just as Hamlet finds out Claudius is his step-father! Both spend a lot of time brooding over these turn of events. Come on Doescher, this was a no brainer. Doescher even has Luke questioning his place in the world and the use of war, yet never do we hear any hint of a doubting Hamlet. Doescher says he decided to have Yoda speak in haikus. He tells his readers this in the afterwards. I would have liked to have known this before I started reading. Yoda’s odd speech pattern baffled me, and jerked me out of the story. I spent too much time trying to figure out what Doescher was doing. 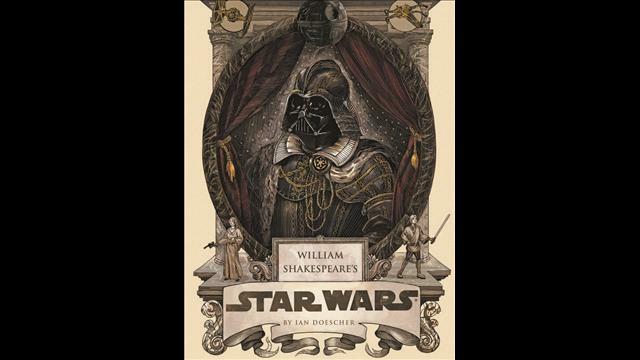 Remember, Doescher is the one who is claiming to do a mash-up of Shakespeare and Star Wars. Sadly, Shakespeare just doesn’t show up enough to make this a true mash-up. Unlike the first book, the references are few and far between. When he does use Shakespeare the lines feel forced, as if Doescher had just remembered he had to add them in. If flurries be the food of quests, snow on. The oddest mix of Shakespeare and Star Wars comes right after Vader has entered. He has a conversation with a few commanders and after they leave he unexpectedly goes into a soliloquy that originally was Shylock’s speech, spoken in frustration for his abuse by the Christians. Hath not a Sith eyes? Blast us. Shall we not injur’d be? While this may delight some Star Wars fans, it had me puzzled. Sure, he may feel abused by the rebels, but it is he who is embarking on a plan to wipe them all out. This famous speech feels forced and out of context to the scene before and after. For true students of Shakespeare Doescher’s use of the Bard’s words may fall flat. Doescher does remind his readers that above all else this book is written to be fun. And for all the faults I have pointed out, it really is fun. But, if this is a series titled William Shakespeare’s Star Wars, then more care should be given to make proper use of the Bard’s world. To quote Hamlet,”O God, I could be bounded in a nutshell and count myself a king of infinite space…” Come on Doescher, Shakespeare’s world is infinite space, set in a time, long, long ago. Use it, and use it well. I’d be remiss if I didn’t mention we are in the middle of Shakespeare Week. Shakespeare Week is a new national, annual celebration to bring Shakespeare to life vividly for millions of primary school children. I found out about it on Twitter (where else) because the Globe Theater is dedicated this week to the education of children. Most of the celebration is taking place in the UK, but I thought it would be fun to do a quick review of different ways everyone worldwide can introduce or be introduced to Shakespeare. After all, young or old, we can all be students of Shakespeare! 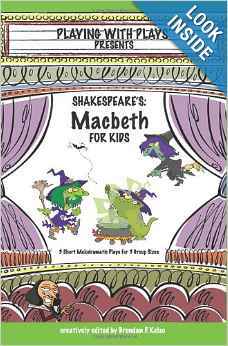 It is never too early to teach children about Shakespeare. Ehren (from the wonderful podcast, Chop Bard) & Judy Ziegler and Shanon Sneedse gives parents an opportunity to teach their children the alphabet through an imaginative use of Shakespeare’s characters. The Shakespeare Alphabet Book is a delight. 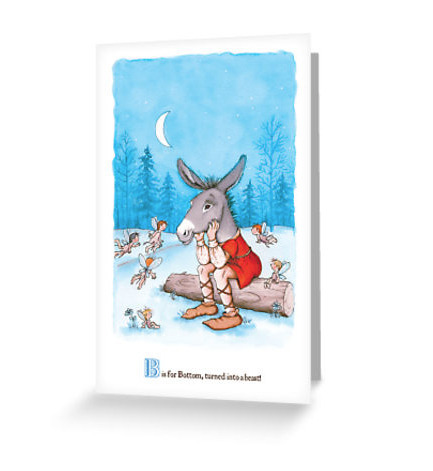 The picture book goes through the alphabet in short rhyming sentences. A is for Ariel, waiting to be released. B is for Bottom, turned into a beast! The pictures are so masterfully done that when I first opened I was kinda sad. I almost wanted another baby just so I could decorate a nursery based on the pictures. Oh to be a child again and know this was my introduction to words, words, words! 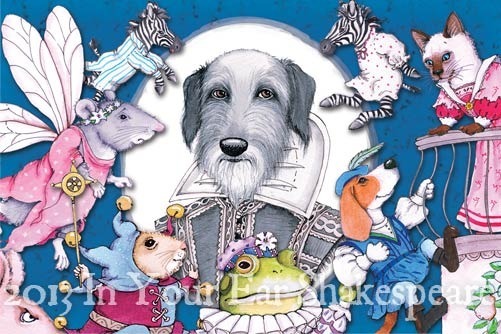 Shakespeare for Kids is a wonderful site dedicated to helping teachers and parents introduce the plays to kids 6 to 17. Besides having a very fun interactive site (yes, I’ve spent a lot of time here) they offer a series of books, “Playing with the plays”. I haven’t spent anytime with the books, but from the reviews, they are a big hit with educators. For the middle schooler who says he doesn’t like to read, Conor McCreery and Anthony del Col has written the comic book series, Kill Shakespeare, sure to change his mind! I blogged about this a couple of years ago https://theviewfromsarisworld.com//?s=Kill+Shakespeare&search=Go on National Comic Book Day. The idea behind the series is to write a story that pits many of the heroes and villains of Shakespeare against each other when King Richard dupes Hamlet into hunting down and killing a man named William Shakespeare. McCreery and del Col came up with the idea while watching Kill Bill. I don’t read a lot of comics anymore, yet I am hooked on this series! It is hard to find back issues, so if you want to introduce your student to the series you will have to buy the compendium. It may not be a “purist” (a word my friends use to describe me re Shakespeare) take on the plays, rather it can be used to introduce characters and themes to those who are a little afraid to take on the Bard. It is a fine way to enter his world. As you can see, the books are based on the Star Wars stories, written in a way that can be used to teach students how to appreciate the words of Shakespeare. For those who are familiar with Shakespeare’s plays, it’s fun to pick out the satirical use of some of the Bard’s more famous quotes. But let’s say your student has to read Shakespeare for the first time and is freaking out. 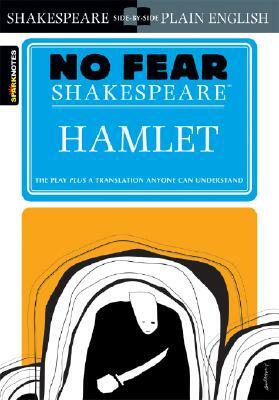 The No Fear Shakespeare series is the best way to pull him or her off the ceiling. Each page of the play is followed by a modern rendition. One your student feels a little better about how to read the plays, I would follow this up with a Folgers or Arden copy. Both of these publishers offer detailed explanations for lesser known words and offers quick synopses of each scene. If your student has an iPad, they are in for a treat! Shakespeare at Play is starting to offer a wonderful iBooks series that so far, is really impressive. Each book contains the play and a video of it. The acting is amazing! You can follow the play by scrolling down the pages. For some it may be hard to read and listen at the same time, yet it is easy to see how this would be of value to students. The acting makes the words come alive so that they make more sense to those who are struggling to understand what they are reading. So far I have enjoyed MacBeth, and next will download Hamlet (my favorite). I wish Shakespeare at Play great success! Speaking of seeing the plays, did you know Amazon Prime offers a lot of them for free? I was dismayed to find that Netflix stopped offering their streaming Shakespeare plays, at one time they had quite a few. The other day I wanted to see The Merry Wives of Windsor (my least favorite) and stumbled across it on Amazon Prime. If you find your student learns to love Shakespeare and cannot get enough, may I suggest downloading the podcast Chop Bard? Ehren is the ultimate Shakespeare geek, and tackles the plays from an actor and historian’s point of view. Chop Bard is my favorite Shakespeare podcast, though iTunes U offers some good lectures too. So there you have it my friends! My picks for some of the best ways to celebrate Shakespeare Week. What did I leave out? If you want to know more about Shakespeare and why he is important, just enter his name in my search bar. You will find I have a lot to say about the world’s greatest playwright. Author sarijPosted on March 20, 2014 March 19, 2014 Categories Books, Current Events, Podcasts, ShakespeareTags books, comics, Movies, picture books, plays, Podcasts, Shakespeare Week, Star Wars7 Comments on Celebrating Shakespeare Week!